The Dude. One cool guy. Who one day comes home to find two thugs have broken in and ruined his favorite carpet - the one that made the room "hang together". Thing is, they did it because he's got the same name as one of the richest men in town. Lebowski. But, hey, no problem. He'll get even. At least he'll get someone to pay for the carpet. I kept hearing stuff about this one, but I hadn't seen it. When I spotted it in Walmart last month for $7.50, I decided I would go ahead and get it. The movie is somewhat bizarre and odd, but that works for it and helps to make it more entertaining in my opinion. Things start off rather straight forward. The Dude is mistaken for someone else and his rug is used as a toilet, so it makes sense that he's ticked. His friend Walter, who has anger issues, gets him more rilled up over the situation. After that, more and more starts going on and things do get a bit more complicated. I think the movie is more about following The Dude through all the ...weirdness than in finding resolutions for everything. Though there are some resolutions. A lot of what happens is funny in a twisted way. The humor won't appeal to everyone, but I think it works perfectly for the movie. The language is extreme at times, so that will probably offend some people. There is a little bit of violence in the movie, but I don't think of it as being violent overall. All the characters are different in some way in this movie. The Dude is very laid back and tries to avoid anything that is stressful of requires him to do much of anything. It isn't that he isn't capable of doing more. He just choses not to. He is far from stupid and he actually figures several things out. 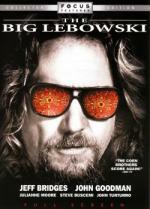 Jeff Bridges is absolutely amazing in the part. Walter keeps pushing The Dude to do things, and it rarely turns out well. Walter definitely has anger issues. Donnie is just sort of around, joining a conversation in the middle and asking questions that really tick off Walter. Overall, I ended up really enjoying this movie and I'm glad I decided to pick it up. It is kind of bizarre, but it is extremely entertaining. The movie isn't going to appeal to everyone though. I did get a review posted on Epinions recently. I love this film. And Marie, if you like it now, you may enjoy it even more each time you watch it, because it's that sort of movie. Matthias and I had a lengthy discussion about this a while back because it boils down to a parody of Film Noir and Raymond Chandler (The Big Sleep) in particular. If you haven't seen that film, I'd strongly recommend it. I mean, it's a bloody great film anyway, but it might give you a different slant on this. The Coens for me are hit or miss, but this was definitely a big hit. I know the comparisons to The Big Sleep...the Coens themselves mentioned that in the extra on the DVD. I haven't seen that one yet..another to add to my list.